Informal mindfulness practices for those of us who don’t have five minutes to contemplate a raisin. Eating as mindfully as we do on retreat or in a mindfulness course is not realistic for many of us, especially with families, jobs, and the myriad distractions around us. This is not to mention that our friends, family and colleagues might not have the patience to eat with us as we take five minutes with each bite. 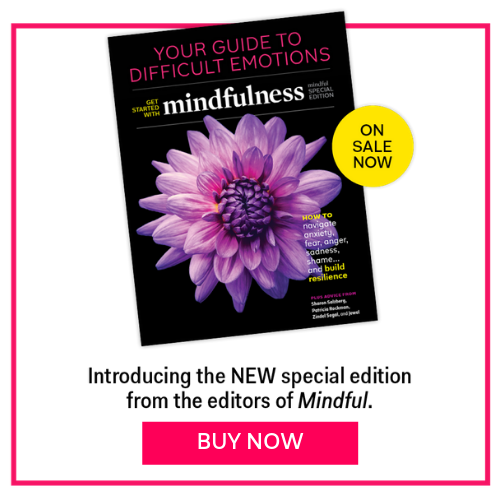 So have some self-compassion, and consider formal mindful eating on retreat and special occasions, as well as informal mindful eating in your daily life. What I want to offer in this piece is what I call more mindful eating, perhaps “informal” mindful eating as opposed to formal mindful eating. Especially during the craziness and stress and extra food of the holidays, that Halloween to New Years stretch in which are more likely to eat mindlessly than mindfully. Here are six simple guidelines to keep in mind to discern between mindless and (more) mindful eating, and bring our bodies and minds back together. Eating rapidly past full and ignoring your body’s signals vs. slowing down and eating and stopping when your body says its full. Are you responding to an emotional want or responding to your body’s needs? Often we listen first to our minds, but like many mindfulness practices, we might discover more wisdom by tuning into our bodies first. Rather than just eating when we get emotional signals, which may be different for each of us, be they stress, sadness, frustration, loneliness or even just boredom, we can listen to our bodies. Is your stomach growling, energy low, or feeling a little lightheaded? Too often, we eat when our mind tells us to, rather than our bodies. 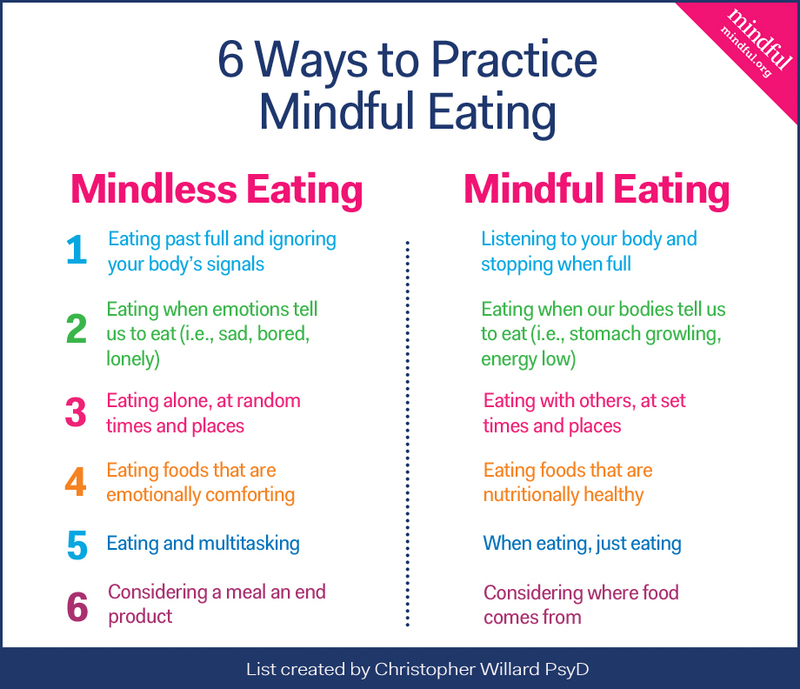 True mindful eating is actually listening deeply to our body’s signals for hunger. Ask yourself: What are your body’s hunger signals, and what are your emotional hunger triggers? Eating alone and randomly vs. eating with others at set times and places. Another way that we eat mindlessly is by wandering around looking through cabinets, eating at random times and places, rather than just thinking proactively about our meals and snacks. This slows us down for one thing, but prevents us from developing healthy environmental cues about what and how much to eat, and wires our brains for new cues for eating that not always ideal. (do you really want to create a habit to eat every time you get in the car, or other situations?) Sure, we all snack from time to time, but it can boost both your mind and body’s health, not to mention greatly helping your mood and sleep schedule to eat at consistent times and places. Yes, that means sitting down (at a table! ), putting food on a plate or bowl, not eating it out of the container, and using utensils not our hands. It also helps to eat with others, not only are you sharing and getting some healthy connection, but you also slow down and can enjoy the food and conversation more, and we take our cues from our dinner partner, not over or undereating out of emotion. When we put our food away in cabinets and the fridge, we also are more likely to eat healthy amounts of healthy food, so consider what’s around, where it is and whether it’s in sight. If we limit eating to kitchen and dining room, we are also less likely to eat mindlessly or eat while multitasking. When food is around, we eat it. And food, not always the healthiest, is often around at the holidays. There are many reasons that the raisin eating it is such a powerful exercise, but one is that when we slow down and eat healthy foods like raisins, we often enjoy them more than the story we tell ourselves about healthy foods. You don’t have to plan your food down to each bite, and its important to be flexible especially at special occasions, but just be aware of the fact that you might be changing your eating habits at different times of year or for different occasions. And when you do plan ahead, you are also more likely to eat the amount your body needs in that moment than undereating and indulging later, or overeating and regretting it later. Classic advice is to also not shop when hungry, but the middle path applies here as well. A psychological effect known as “moral licensing” has shown that shoppers who buy kale are more likely to then head to the alcohol or ice cream section than those who don’t. We seem to think that our karma will balance out and we can “spend” it on junk food, or other less than ideal behaviors. Eating foods that are emotionally comforting vs. eating foods that are nutritionally healthy. This is another tricky balance, and ideally we can find nourishing foods that are also satisfying and comforting. But think back to that first mindful raisin. Did that seem appealing before you tried it? There are many reasons that the raisin eating it is such a powerful exercise, but one is that when we slow down and eat healthy foods like raisins, we often enjoy them more than the story we tell ourselves about healthy foods. As we practice eating healthier and a greater variety foods, we are less inclined to binge on our comfort foods, and more inclined to enjoy healthy foods, ultimately finding many foods mentally and physically satisfying as opposed to just a few. Considering where food comes from vs. thinking of food as an end product. Unless you are a hunter-gatherer or sustenance farmer, we have all become ever more disconnected from our food in recent years. Many of us don’t even consider where a meal comes from beyond the supermarket packaging. This is a loss, because eating offers an incredible opportunity to connect us more deeply to the natural world, the elements and to each other. When we pause to consider all of the people involved in the meal that has arrived on your plate, from the loved ones (and yourself) who prepared it, to those who stocked the shelves, to those who planted and harvested the raw ingredients, to those who supported them, it is hard to not feel both grateful and interconnected. Be mindful of the water, soil, and other elements that were part of its creation as you sit down to eat whatever you are eating. You can reflect on the cultural traditions that brought you this food, the recipes generously shared from friends, or brought from a distant place and time to be a handed down in the family. As you consider everything that went into the meal, it becomes effortless to experience and express gratitude to all of the people who gave their time and effort, the elements of the universe that contributed their share, our friends or ancestors who shared recipes and even the beings who may have given their lives to a part of creating this meal. With just a little more mindfulness like this, we may begin to make wiser choices about sustainability and health in our food, not just for us but for the whole planet. Multitasking and eating is a recipe for not being able to listen deeply to our body’s needs and wants. We’ve all had the experience of going to the movies with our bag full of popcorn, and before the coming attractions are over, we are asking who ate all of our popcorn. When we are distracted, it becomes harder to listen to our body’s signals about food and other needs. With your next meal, try single-tasking and just eating, with no screens or distractions besides enjoying the company you are sharing a meal and conversation with. So while formal mindful eating practices may be what we think of when we look back on a mindfulness course or retreat we attended, the reality is that we do live, and eat, in the real world which is a busy place. But we can take the insights gained from our formal practice- slowing down, listening to our bodies, doing one thing at a time, making even small rituals, and considering all that went into our meal on a more regular basis and bring more informal mindfulness to our daily meals.